Rihanna was spotted in New York wearing her favourite Rodarte sweatshirt. The shirt was designed exclusively for Opening Ceremony and is currently available in red for $155.00. She kept her outfit cute and casual with Trukfit‘s Camo Culture snapback. 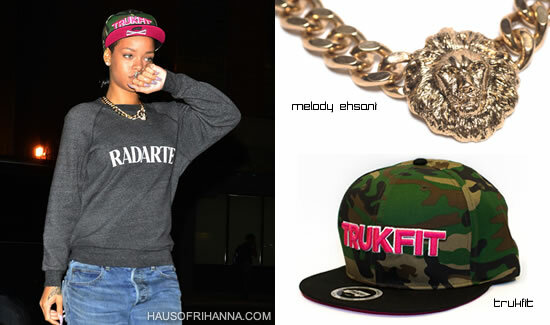 We know Rih loves her snapbacks and she recently shared a pic on her Instagram of a different Trukfit hat. Rihanna’s gold-plated lion head necklace was designed by Melody Ehsani. This is the Queen of the Jungle necklace and will set you back just $69.00. Rihanna is a fan of Ms. Ehsani and has worn several pieces including the Bad ring and the Swarovski bamboo earrings.